If anda had a Gooty Sapphire Ornamental will anda hold it? Curlyhair atau Mexican Red Knee Tarantula? Which specie of tarantula is your favorite? Which species of tarantula is your favorite? Which species of tarantula is best for a beginner owner? WARNING!!! My 7" female P. cancerides eats mouse! If anda are offended atau squeamish sejak this type of content, go run along to your sad, little Emo corner and don't throw a fit, s'il vous plait. I warned you! Theraphosids are the greatest pets (second to cats)! I have owned over 20 individuals and 20 different species. 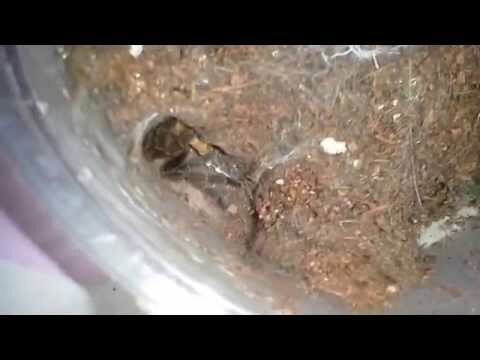 This is my pathetic, little, wimpy senarai of tarantulas I have owned and currently owned. a comment was made to the poll: If anda had a Gooty Sapphire Ornamental will anda hold it? a poll telah ditambah: If anda had a Gooty Sapphire Ornamental will anda hold it? an answer was added to this question: Which species of Tarantula is your favorite? a comment was made to the poll: Curlyhair atau Mexican Red Knee Tarantula? Which specie of tarantula is your favorite?